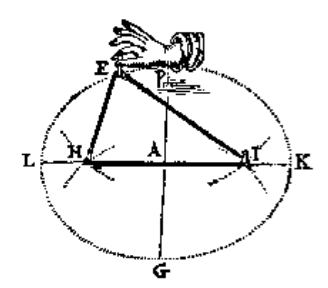 The picture above comes from the 17th-century manuscript Sive de Organica Conicarum Sectionum in Plano Descriptione, Tractatus (A Treatise on Devices for Drawing Conic Sections) by the Dutch mathematician Frans van Schooten. The ellipse construction in the illustration is quite simple. Press two pins into a corkboard, place a loop of string around the pins, pull the string tight with a pencil, and trace the pencil tip’s path as you pull the pencil around the taut string. Guaranteeing that the traced path is an ellipse is this definition of an ellipse: An ellipse is the set of points P such that PF1 + PF2 is constant for two fixed points, F1 and F2. I don’t think any introduction to ellipses is complete without students making their own physical model of the pins-and-string construction and experimenting with how the distance between F1 and F2 as well as the length of the string affects the shape of the ellipse. But I also think there is value in building a Sketchpad version of the ellipse construction. Below is a pre-built Web Sketchpad model that your students can investigate. In my upcoming post, I’ll show how you can construct this model from scratch using Web Sketchpad. I do this. I use the top to the printer paper box so when you put the pins in, it doesn’t poke the desk. I also tried twine which didn’t work well, but floss worked well. I printed some big graph paper on cardstock then laminated it so the kids pin it to the box top. It is laminated so the kids can use dry erase markers to draw it. Thanks for your comment. I’ve used floss successfully, too.